in all of Las Vegas! operating in the same location since 1970. All Dinners include Free House Wine with dinner. All Dinners Include Free House Wine with dinner. Although if you would like other wine the house wine. 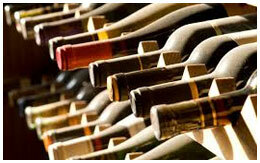 We have a nice selection of wine to purchase to go along with your dinner. 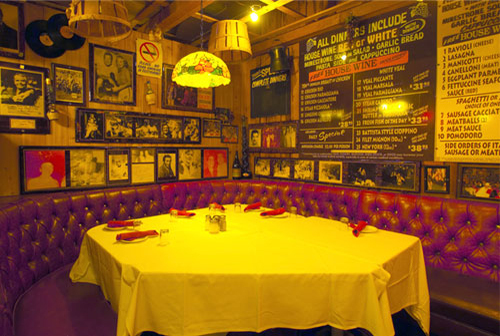 The hole in the wall has a very relaxed Italian feel to it. With a lot of eclectic items adorning the ceiling and walls. Whether it be one of the largest collection of miniature liquor bottles in the world, baskets hanging from the ceiling, an Alaskan Moose named Moooosolini, or many of the pictures of entertainers and other notables adorning the walls. I love Battista’s, we have been coming here for years. The atmosphere is fantastic. 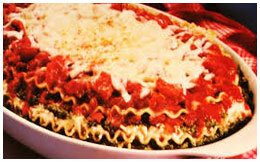 I personally always have the Veal Parmegiana or the Lasagna. The strolling according player, Gordy is one of the highlights. 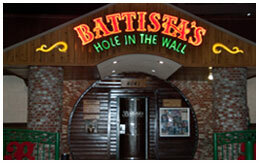 ©2014 Battista’s Hole in the Wall. All Rights Reserved. Site by Perkolate.